Got monkeys on the brain? How about a Monkey Tattoo! Whether you're inspired by the misadventures of Jack the Monkey in Pirates of the Caribbean or the artwork in the film 12 Monkeys, tattoos featuring these comical characters fit every personality and style. Monkeys are jovial, energetic, and witty little creatures that have strong ties with many religious groups. One Buddhist legend has it that before Buddha ascended to heaven, he invited all the animals in the world to join him. Unfortunately, only twelve took up his offer and Buddha awarded them by naming the Zodiac signs for each animal. The Monkey is the ninth sign in the Chinese calendar and the next Year of the Monkey will be 2016. The monkey was charged with the task of accompanying a monk carrying Buddha's holy teachings. The animal's quick wit and courageous spirit protected the monk from demons, helping him to spread Buddha's holy teachings to various corners of the world. As such, monkeys are viewed as messengers of the gods and protectors. Monkeys also symbolize Repentance and Salvation. In Buddhism, one of the first steps on the path to Enlightenment involves quieting the restless 'Monkey Mind' through meditation. There has been intense debate about the controversial use of primates in various scientific experiments. Since these animals are the closest genetic relatives to humans, they are test subjects in space exploration programs and clinical trials deemed unsafe for humans. However, many animal activists continue to lobby to protect their rights. With a genetic difference of about 3%, Chimpanzees are our closest living relatives. This makes them prime test subjects for countless controversial experiments. Chimps hold a special place in our hearts and many persons with Chimpanzee tattoos feel a close connection with these wonderful animals. http://en.wikipedia.org/wiki/Three_wise_monkeys is an 8th century Tendai-Buddhist folklore that became incorporated into Confucius' Code of Conduct. The original concept actually didn't involve monkeys; the phrase was 'Mizaru, Kikazaru, Iwazaru' which means 'don't hear, don't see, and don't speak'. But when spoken, the term 'zaru' sounds like 'saru', which means 'monkey'. Since then, this saying has been associated with monkeys. There's a fourth monkey, 'Shizaru', which is usually depicted with his arms crossed and represents 'do no evil'. Persons with this tattoo identify with Confucius' Code of Conduct and Morals. Popular tribal patterns have Polynesian, Native American, and Haida influences. These beautiful designs are meant to highlight the connection between monkeys and their image in countless religions. They often incorporate playful elements of the animal's personality. After all, you can't keep things too serious. Persons have always sought creative ways to decorate their belly buttons. One such design incorporates images of animals, like cows and monkeys. Monkey Belly Button tattoos are an extension of the 'Pull my Finger' prank and are a great way to show your playful nature. A Grease Monkey loves pulling things apart in order to put them back together. In the wild, monkeys are notorious for touching, poking, prodding, and smashing objects in an attempt to figure out how they work. Grease Monkey tattoos are a tip of the hat to your curious nature and symbolize the inquisitive spirit of these animals. They represent your need to discover and explore. The Evil Monkey always launches attacks from the depths of Chris Griffin's closest and is his arch nemesis in the popular TV series, Family Guy. However, the Evil Monkey eventually befriended Chris, sharing a few pearls of wisdom over some not so legal plants. Having an Evil Monkey tattoo is a fun way to commemorate this series and has no deep spiritual significance. The image of a monkey staring at a skull sends a powerful message about man's Mortality. Skulls typically represent Death and Destruction, while a monkey symbolizes Humanity on a whole (since we share a common ancestor). Monkey Skull tattoos speak to persons who are trying to come to grips with drastic change in their lives. The infant of any species represents Innocence and Youth, and a Baby Monkey is no exception to this rule. Persons normally put this tattoo design as a way to commemorate a child or to pay homage to their own childhood. 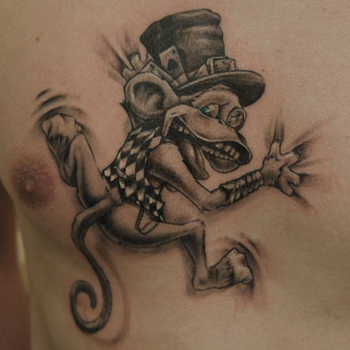 Choosing the right Monkey tattoo design is simply a matter of figuring out what your new ink will symbolize and where it will be placed on your body. In 20 years, you should be able to look back on your tattoo with pride and fond memories. If you need some inspiration, then visit us at www.itattoodesigns.com or take advantage of our Custom Tattoo Service, where our team can design a truly unique piece for you.